The clarion has been blown; all the entrants are on their groves; its mandate 2016 knocking vigorously at the door! From high voltage rallies to revamping of policies to stalwart leaders representing numerous political parties visiting Assam, they are leaving no stone unturned to lure the voters. Thus, battle for 2016 Assam assembly election has been kicked off. If experts are to be believed after 15 long years of Congress regime in the state the question-what next, makes this electoral clash even more interesting. According to political pundits keeping aside smaller parties, the Congress, All India United Democratic Font(AIUDF) and the Bharatiya Janata Party (BJP) could be espied as the key players of the game. Unlike previous terms when the battle is restricted to the regional parties, the poll scenario looks different. BJP is the new but a powerful entrant here. After its unprecedented victory in the 2014 Lok Sabha elections the Narendra Modi government went all guns blazing to leave its footmarks across the country forming government in Haryana, Mumbai and a coalition in Jammu and Kashmir. Though the BJP’s winning chariot was halted in Delhi by Aam Aadmi Party, but now the BJP will look to get back in the winning aura again. According to BJP minister Sarbananada Sonwal over 3,000 aspirants have submitted applications seeking BJP party tickets for the 126-member state assembly elections in Assam. Added to that migration of flamboyant leader Dr. Himanta Biswa Sharma and other ten other MLAs from Congress to BJP, gives a sense of the saffron party’s firm eye to grip the state. Thus, this makes the fear of BJP playing its age old card of bigotry politics for polarization and communalization quite obvious. The BJP has already opened its card beyond doubt. The first litmus test came in the form of center’s notification granting asylum to Bangladeshi Hindu migrants in Assam. Though this was mere notification but the BJP succeeded to create a divisive strife in Assam. As repercussions on one side we saw various Assamese organizations registering their protest against this notification while on the other side anti-Assamese slogans made its way from numerous non-Assamese groups. But, behind the ethnic tension simmering in the state very few perhaps realized that it was a well orchestrated one by the BJP and the damage of polarization was already done! The heinous Dadri lynching that sent shock ripples globally is assuredly afresh in our minds, but what came as aftermath of the saddening episode was even more shocking. 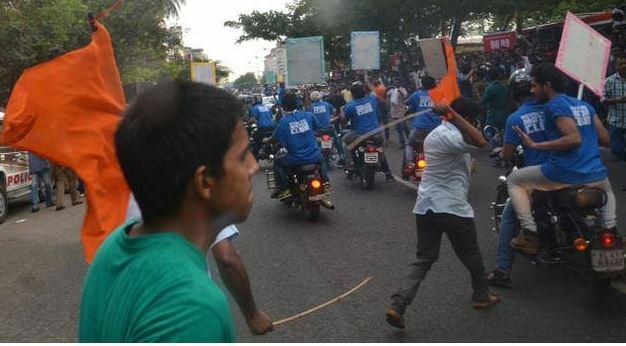 With the arrest of one Vishal, having political affiliations with the BJP, accused of inciting the mob; one can’t downplay the fact of an orchestrated communal disharmony on part of the saffron brigade. Even the modus operandi was much similar to that of the 2013 Muzaffarnagar riots. First an announcement on a loudspeaker about a cow slaughtered and later rumor spreading across the village via WhatsApp and social media tools. This gives enough instance of the saffron brigade’s type of politics. The recent strife between two religious group in Silchar gives yet another instance of communal polarization to score political brownie points. It was on October 1st when I opened my mailbox to astonishment. A mail from a gentleman read, “Can you please help people of Barak Valley. We are facing severe and major communal problems from last few days.” He further went on to indicate the involvement of saffron fanatics behind these acts. Being presently based out of India, I didn’t have much for him to offer. All I could do was to appeal him to maintain calm and not get instigated by rumors and take help of the administration and police in situations of utmost adversity. But, when I went on to cross check his claims I was appraised that BJP leaders were brazenly defying the law. It went to an extent where Police had to arrest BJP Silchar MLA Dilip Paul and Cachar district president Kaushik Rai after they flout Section 144 in Meherpur. But, what was even more jaw dropping was when acting deputy commissioner of Cachar, M K Das, convened an all-party meeting to maintain peace in the town, BJP decided to boycott it! There has also been attempts to create strife by a section of Muslim community as well. As of recently the secretary of Kumarpara Muslim Jamat Committee wrote to the Deputy Commissioner against the immersion procession of idols during Durga Puja. Kumarmara is counted among Guwahati’s one of the oldest and busiest areas. As per the request of that committee representative since a mosque is located on the route thus durga puja procession often tend to disturb those offering ‘namaz’. This saw emotions running high while a section looked to gain political mileage giving it a communal colour. However, sharp criticism and intervention of some right thinking Muslims of the city brought an end to this drama. But, being on ground it’s WE the people of Assam who can defeat these religious fanatics and bigotry politics. Home to a diverse language, communities and ethnicities it’s being Assamese that binds us to the feeling of oneness. The other day I went to a coffee shop in London while the caterer was preparing my cup I was browsing through the various posters and ads displayed. I stumbled upon one which informed about the availability of veritable Assam tea. When I enquired the manager if he knows where Assam is he answered in negative but added that Assam tea has an invincible fame in the city for its flavor. I could see the glitter in his eyes when I told him that I hail from Assam and it is in India. I had moist eyes, I reckoned my land, I was drenched in a patriotic fervor! Perhaps that’s the specialty of Assam, that’s the pride in being an Assamese. Focusing back to the election fever, there would certainly be attempts to taint the peaceful setup of Assam. But, the inhabitants of the state have to be aware of any such polarizing acts by saffron brigade or any other bigots. Assam is the land of Srimanta Sankardev and well as Ajan Fakir. We are known globally for upholding the truest virtue of harmony, unity and peace. Time now to continue the endeavor with same enthusiasm and not succumb to bigotry politics and fanatics.